Let’s say you donate three books to your local thrift store: a book that is waterlogged, a book that is overly common, and a book that is innocently quite valuable. What happens to these three little books? The waterlogged book will most likely in the trash compactor or recycling bin. The valuable book will end up in the store. But how about that 10th copy of a book the thrift store has that hasn’t sold? Common books get better fates than used bookstores. 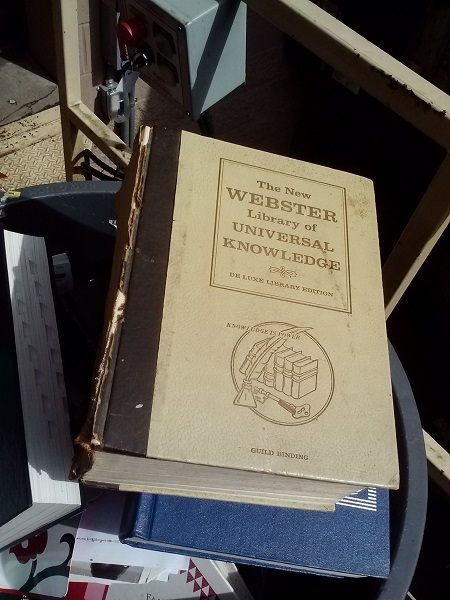 When I’ve brought in books to used bookstores to sell, they’ll tell me with a straight face that they’ll donate the books to local charities, when you can usually tell the fate of those books when you peek into their dumpsters. 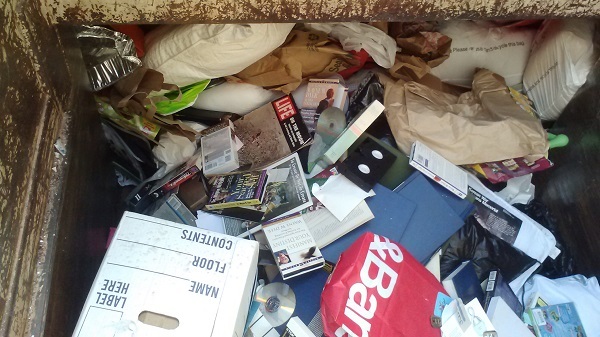 Depending on local laws, if the dumpster isn’t gated or locked, then, you might find the books or other items you donated or were told would be donated. If the books were in acceptable condition and could perhaps be resold at another location, they were shipped in large boxes to either distribution warehouses or directly to other sites. I’d weigh, shrinkwrap, and stage them for later shipment. In that regard, books and clothing have the best chances of actually helping out any thrift store’s bottom line. I will still just recycle anything beyond repair or value. As I’m going through my book collection, I’m sorting the books into three main categories: books I’d like to read in the next three months, books I’d like to read in the next three years, and books I don’t care about reading. I’m packing the “3-year” books into boxes, digitally cataloging their contents, so that during the next three years, I can decide how valuable those books are to me. Maybe, actually: obscurity and cost of reallocation? My attitude toward book ownership has changed throughout this move process, and in part, because I’m actually reading books again. I placed a large hardback book of some popular fiction novel in the “books I don’t care about reading” pile. If I ever wanted to read it, I could easily borrow it from the library, or, buy it again cheaply from some thrift store. My book collection should no longer glorify my “to do” lists. My personal library should only consist of books that I actively plan on reading or rereading. Nothing, therefore, should be so sacred that it should never be gazed upon, much less read. Such items of fragility are a burden to own and maintain and, even if they were to garner an external value beyond my own, shouldn’t be kept for trivial reasons. Once upon a time, I wanted to salvage the best items. This was in a reaction to the horrors against materialism I saw while working at a thrift store, but now I accept that a healthy part of owning stuff is letting other stuff go. We might look at objects once discarded with new eyes, maybe waxing tragic nostalgia over throwing out something, or feeling bad that we don’t own a complete version of something. We can go rebuy these things. It’s almost a bad thing to consider every item in our collections, be them books or whatever, to be completely sacred. There are some clunkers in there. Don’t be afraid to donate the books you don’t care about reading anymore, especially as your eyes gaze upon some new book that might enlighten you in some different way of thinking. Most of them will be treated well. The ones that were truly garbage will be trashed, but everything else, from what I saw, was either sold in that store or shipped to be sold elsewhere. That’s about as good of fate as one should expect for some object, especially the one that has oversaturated the market you live in. The thousands of dusty Books of the Months have to go somewhere. Keep the ones that speak to you. Even if that plan is to go through an entire list of your library’s contents, and read everything in alphabetical order, that will help refine your value of each book. I’ve only focused so far on books that I want to read, but I imagine there will be a cut-off point where if I procrastinate in reading a book for more than a week, at 10 minutes daily, then it’s time to go. Whether that’s into the donate or read later pile is up to you. The thing is, though, I’m learning to deal with materialism. Clutter, hoarding, collecting; it’s all rooted in this fundamental desire of wanting to be as well-rounded, educated, and informed as I can. In my mind, objects could help me relate more with people, and the more books I owned on obscure subjects, the more I could appear relateable. Why not relate to others by relating directly with others? Cut out the artificial hops between you and other people on your way to becoming more well-rounded and cultured. Don’t read a book to appear a certain way. Don’t own it because it will make you seem a certain way. Read and own it for your own choices. Don’t let your library consume you. It should enlighten you. If I’d known this years ago, it would have helped. That’s why I write with an imperative drive. It’s OK to let go of those books that you bought cheaply at some sale. It’s not a slight against the current “you” that the past “you” enjoyed the idea of owning them. We change as people. Our tastes and interests change. Donating my books on house repair, now, no longer stings. Sources: My personal and professional experiences. Inspirations: I wanted to write about the major sections of thrift stores and how they handled them. Some sections were easier to write than others. Above: trash compactor destroying some magazines and probably old books. Below: A book to be compacted. Not chosen because it didn’t fit the 600×337 mold. Rejected draft: We’ve talked a lot about the worser fates of donations brought to thrift stores. How about books? Those old tomes of past knowledge, either outdated with technology or about antiquated topics, don’t seem to have much use outside of door stops, giving the appearance of having a well-read “library,” or convenient fire starters… right? Well, not exactly. While I didn’t have any experience pricing book donations, I wasn’t often likely to throw out books.